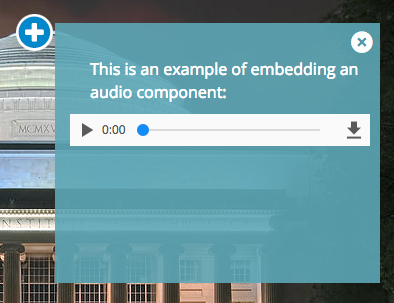 Here's a quick guide to embedding an audio element into the Image Explorer XBlock. Note: Make sure you've installed & enabled the Image Explorer XBlock before attempting this. Note: Files must be under 10mb, so if you're working with uncompressed audio like WAVs or AIFFs, you will want to find a way to compress it down. This will be found underneath the "Advanced" component category. You can use either the static URL or the web URL. You will just need to make sure you follow the above syntax. Make sure to click Save when you're done. That's it! You'll now see an audio player in the hotspot feedback window like you see below.